Donegal manager Declan Bonner says his side owe their promotion from Division Two to a "good blend of youth and experience" in the squad. 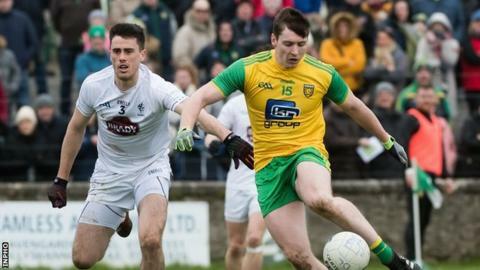 The Ulster champions secured their return to the top tier with a 13-point win over Kildare on Sunday. "It was not a straightforward run through Division Two," reflected Bonner. "There were a lot of tough matches but over the last three games we have been very good." Donegal will meet Meath in the Division Two final next Saturday at Croke Park (17:00). With the Division Three decider not taking place next weekend because of the postponed fixture between Louth and Westmeath, Donegal's game with Meath will form a double-bill along with Derry's Division Four final against Leitrim which throws in at 14:00. Sunday's Division One final between Kerry and Mayo (16:00) will form a triple-header with the Hurling League decider between Limerick and Waterford (14:00) and the Camogie League decider between Galway and Kilkenny (12:00). Most onlookers tipped the Tir Chonaill men for an immediate return to Division One but their league campaign was not without its difficulties. Defeats by Tipperary and Fermanagh in February left Bonner's side needing wins from their final three games. "We still have a lot of improvements to be made but today we were much more consistent over those 70 minutes and we probably had the work done in that first half." Oisin Gallen, Niall O'Donnell and Jason McGee are among the players to have made the jump from minor football to the senior panel this year. Bonner praised the impact of the young players who have added a youthful look to the squad containing seasoned campaigners like Michael Murphy and Frank McGlynn. Donegal begin their provincial title defence with a repeat of last year's final against Fermanagh on 26 May.